For years I had no interest what-so-ever in anything that had to do with solar ovens. I thought they were only for extremist or the outdoorsy type. Solar ovens seemed way too complicated, and I couldn’t image making “real” food in them. Well, boy was I wrong! Living in Arizona I have been insulated from weather related emergencies, thus I have been lazy about preparing for them. In the last few years I have seen things that have opened my eyes to the need for everyone to be prepared for unforeseen events. From the attack on 9/11, to a gas line break that caused a temporary gas shortage, to the falling economy; things can happen in unexpected ways to anyone, anywhere. Besides that, I live where you get an average of 334 days of sunshine a year! It almost seems like a sin to waste that. Also, in the last few years my family and I have become avid gardeners and from there began eagerly raising our own chickens. Solar cooking just seemed to be a natural progression in our efforts to become more self-reliant and thrifty. A little over a year ago we joined the Phoenix Permaculture Guild and began to take all sorts of interesting classes through the guild. One such class I took was on building your own solar oven. I was excited about this particular class because I really wanted a Global Sun Oven, but I was afraid to buy it in case I ended up never using it. I figured building my own oven would be a great way to try out solar cooking. When I got to class I found out we were making solar ovens out of cardboard boxes. How lame was that? What could you possibly cook in a cardboard box? How hot could it get? If it got hot enough to cook in, wouldn’t it catch on fire and burn up? Well the instructor quickly reminded us of the book we had read in school, Ray Bradbury's Fahrenheit 451, named after the temperature at which paper burns. This oven should only reach a temperature of 350 degrees. 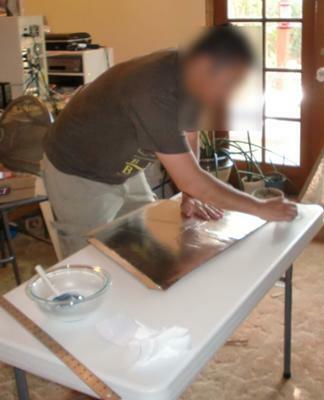 He ended up making a very simple, very serviceable solar oven in about an hour and a half. How cool is that? To have the skill (super power?) to always be able to cook your food as long as you have cardboard boxes, some foil, and the sun. I was hooked, so I did some research. 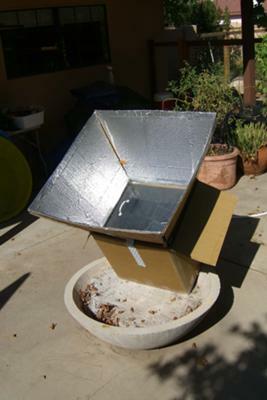 It turns out it is very common to make solar ovens from cardboard boxes – who knew? 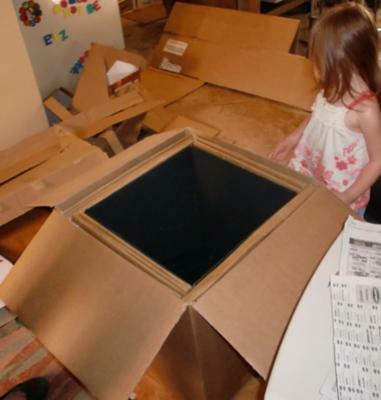 I found a plan for a solar oven that was a little more complicated, but seemed as though it would be a much improved model. Here is where I found the information on the oven my family and I built. Here in Arizona my oven easily reaches 350 degrees and the average cooking temperature seems to be around 250 degrees. I have only had it a few weeks so I am still a beginner learning about the best way to position the oven in the sun, but I still get fantastic results. So far I have made a whole chicken (no, not from my flock), beef stew, corn on the cob, lentil soup, chicken soup, cornbread, and eggplant casserole. Every single thing has turned out great! I also joined a Yahoo group on solar ovens that has been a valuable source of information and a great place to get fired up by other very enthusiastic solar cookers. I don’t use my solar oven every day, but I use it most days I would have used my electric oven. I am sold on solar cooking. Also, cleaning up is easier, as the food doesn’t seem to stick to the pan. It is easy, fun, and produces “real” food that tastes great. My cardboard box oven works splendidly; I have no complaints about its function. I think it works as well as any commercial one would, however it is very bulky. The inner box is 16” x 16” the outer box is 20” x 20”, and the reflectors that extend out add another 16 inches. This makes my oven difficult to move and store. I can see where a commercial oven would have big advantages in size, portability, and durability. So whether you want to build your own solar oven (and there are some as simple as folded up windshield reflectors), or buy the top of the line - do not hesitate. It is easier than you think, and it is a lot of fun. Besides, then you too will have the “super power” to be more self-reliant should the need should ever arise . . . or even if it doesn’t. Nicely done Roxanne, Thank you very much. This Should help to inspire others, don't you think? It looks just like the "Heaven's Flame", a very popular model to build.